Three EU countries block statement slamming US over upcoming Embassy move. The Czech Republic, Hungary and Romania have recently blocked a European Union (EU) statement slamming the United States over its plan to move its embassy in Israel to Jerusalem, a spokesman said Saturday. "We appreciate that Hungary and Romania have taken the same principled stance," he said, adding Zeman had agreed on the refusal with Prime Minister Andrej Babis and Foreign Minister Martin Stropnicky. The US will move its embassy from Tel Aviv to Jerusalem on Monday, following its recognition of Jerusalem as Israel's capital by US President Donald Trump last December. 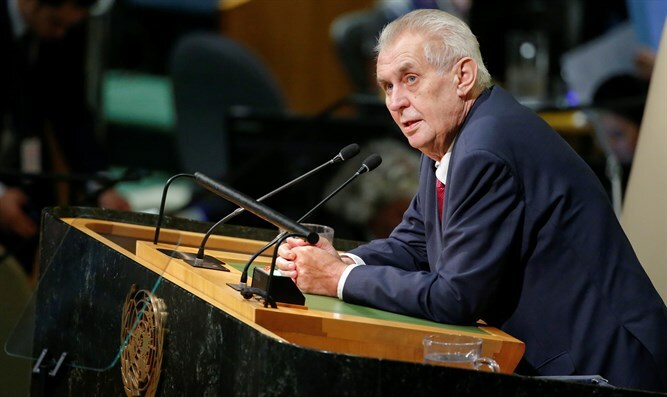 Zeman would like the Czech embassy to move to Jerusalem too, while Romania is also contemplating the move. "Israel and the US are key allies for the Czech Republic," said Ovcacek. "Seventy years ago, Czechoslovakia helped Israel in its struggle for independence and 100 years ago, the US helped Czechoslovakia emerge" as a state, he said. Czechoslovakia split into the Czech Republic and Slovakia in 1993, four years after shedding a totalitarian Communist rule of four decades.